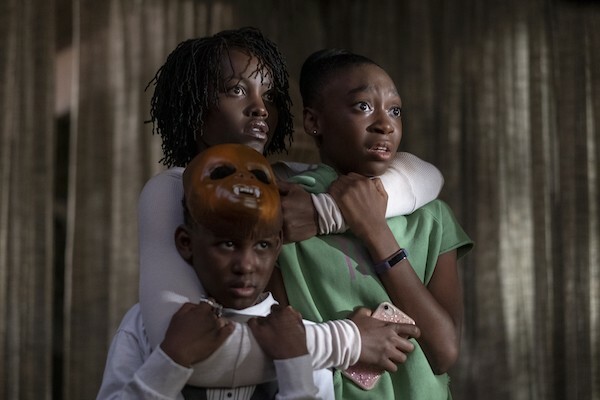 Jordan Peele’s Us (*** out of four stars), the writer-director’s first effort since the Oscar-winning Get Out rocked the nation two years ago, begins with a TV ad plugging 1986’s Hands Across America, a charity event that found over six million citizens and celebrities (among them Robin Williams, Michael J. Fox, then-Governor Bill Clinton, and Chewbacca) linking palms and forming human chains in an effort to raise funds to combat homelessness. Given the theme of Us, another commercial from the period that could work would have been the one for Wrigley’s Doublemint Gum that featured various sets of twins … although the lyrics of “double your pleasure, double your fun” might have given pause to the terrorized protagonists of Peele’s heady, harrowing but ultimately overreaching horror yarn. When the picture commences way back in ’86, Adelaide is just a little girl (played by Madison Curry), one who’s taken to a seaside boardwalk teeming with games and rides. Adelaide wanders off on her own and enters a spooky funhouse of mirrors, wherein she sees herself as a sinister-looking child. But this isn’t merely a mirror distortion — it’s a flesh-and-blood doppelganger, one so frightening that Adelaide bolts from the joint. Cut to the present and Adelaide (Lupita Nyong’o) is now happily married to the garrulous Gabe Wilson (Winston Duke) and the proud mother of Zora (Shahadi Wright Joseph) and Jason (Evan Alex). But an ill-advised trip back to that same beach unleashes a horror that follows the Wilsons back to their vacation home. Standing outside in the driveway, deep in the darkness of night, are four figures who eventually break into the house. And the four are exact duplicates of the Wilsons (and portrayed by the same four actors), although only the Adelaide clone, Red, has the gift of gab, as the other three can only communicate via moans, shouts and howls.